Do you love to travel? Of course you do! We all love to travel. Have you traveled more than a 1 or 2 hour radius from your house? If you live in a bigger state like Texas or my home state of California, have you traveled 4 or 5 hours from your house? Have you experienced the big cities AND the small towns? The reason I ask this question is that I’m getting really tired of people who travel all over the world and then get these ideas that United States has no culture, or that our politics is screwed up, or that people don’t know how to communicate, yet they’ve never even explored their own backyard. They’ve never seen the variety of cultures that live in just one state. As I mentioned in my post about The American Club in Kohler, Wisconsin, I said that I had the benefits of travelling most of the United States with one of my previous jobs. I’m not going to pretend that I have all knowledge of what’s good and evil as I could use some more international travel under my belt, but I have traveled both my state of California and many other states quite extensively. Did you know that California is home to what is considered the smallest mountain range in the world, the Sutter Buttes. 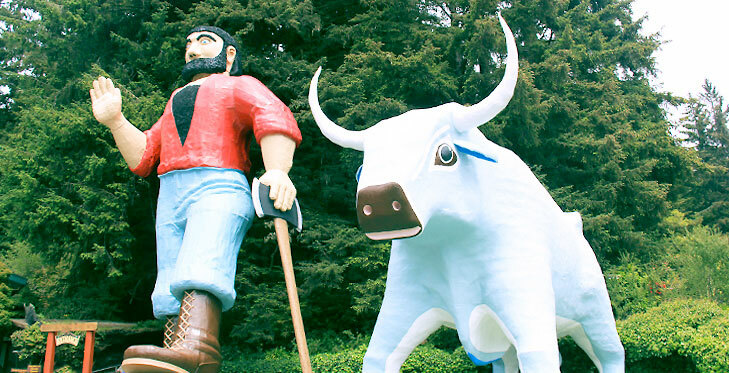 In the Northwest corner of the state stands a huge statue of Paul Bunyan and his ox, Babe. How many federally recognized Native American tribes do you think are in California alone? Over 100!!! How many lakes are in California? How many volcanoes are in California? How many are active? Do you know what the largest industry is in California? Here’s a hint, it’s not movies or technology. Ever visited a California mission? Ever traveled from one end of California to the other? Either on Interstate 5 or Hwy 101? By the way, California has some of the best hunting and fishing in the country!! Some towns in California are so into rodeos that they actually dedicate a full week to celebrating the rodeo when it comes to town! Sure this sounds like a commercial for California, but this could be any state. I urge you to get out and explore your own backyard and the neighboring counties. Spend time in some small towns and cities getting to know the people and what really drive those places. If you’re from the big city, then it’s my guess that you’ll learn how much you rely on these towns for your everyday existence. And hopefully you’ll learn that their way of life, while vastly different than yours, has a purpose. I also hope that you pay attention to the tools that these people use, like big trucks, guns, and other things that often seem so taboo in large cities. What have you found exciting about your home state? Have you traveled it much? Ever thought of taking a road trip around the United States?